Are you looking for a premium Chevrolet crossover SUV in the Glendale Heights and Bloomingdale area? If so, then you may be trying to decide between the 2016 Chevrolet Equinox and the 2016 Chevrolet Trax. Sunrise Chevrolet is here with a handy comparison guide to both vehicles! The interior of the 2016 Chevrolet Equinox has a stylish, sleek cabin with a smoothly flowing wraparound interior. The backseat is luxuriously roomy, with plenty of legroom thanks to the slide-and-recline seat bench. You’ll get 31.5 cubic feet of storage space when the 60/40 split-back rear seats are up, and 63.7 cubic feet of storage space when those seats are folded down. You’ll be able to choose from premium cloth upholstery and leather upholstery, along with power front seats with height and lumbar adjustment and the option of heated seats. 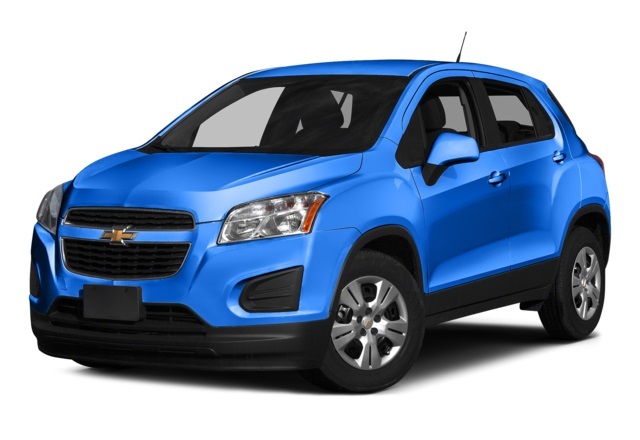 The 2016 Chevrolet Trax is designed to fit your needs from one day to the next. The 60/40 split-folding rear seat bench and fold-flat passenger seat lets you cart around items that are up to eight feet long, with 48.4 cubic feet of storage space in this compact crossover SUV. The cabin has a simple and sporty look, with plenty of comfort features available such as heated leatherette seats and climate control. Finally, the dashboard gives a sense of dynamism and speed with its motorcycle-inspired layout and instrument panel. 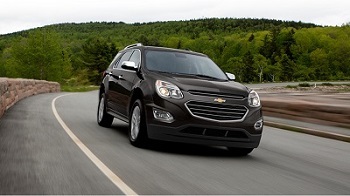 The 2016 Chevrolet Equinox features two available engine options. The base engine is a 2.4L four-cylinder that produces 182 hp and 172 lb-ft of torque and can accelerate from 0 to 60 mph in just 9.8 seconds. It gets an EPA estimated 32 mpg highway and can tow up to 1500 pounds when properly equipped. The available 3.6L V6 engine features dual exhaust tips for incredible performance and produces an impressive 301 hp and 272 lb-ft of torque. It can accelerate from 0 to 60 mph in just 7 seconds, and gets 24 mpg highway according to the EPA. The max towing capacity with this engine is 3500 pounds. The 2016 Chevrolet Trax features a turbocharged 1.4L four-cylinder ECOTEC engine, which produces 138 hp and 148 lb-ft of torque for responsive and nimble performance. The standard variable valve timing and six-speed automatic transmission help the Trax get up to an EPA-estimated 34 mpg highway. The 2016 Chevrolet Equinox has plenty of luxurious features to keep you connected and alert. You’ll get standard OnStar communications with a 4G LTE Wi-Fi hotspot, as well as Bluetooth phone connectivity with a seven-inch touchscreen interface that connects to a rearview camera. You’ll also get a six-speaker sound system. Upper level trims add satellite radio and a compass, as well as Bluetooth audio connectivity and Chevy’s MyLink app suite interface with voice command controls and streaming Internet radio with smartphone app integration. The top of the line LTZ trim adds rear parking sensors and driver memory settings. You can also opt for a blind-spot monitor with rear cross-traffic alerts, lane departure warning, and forward collision alert systems, a navigation system, and an eight-speaker audio system. The 2016 Chevrolet Trax has a wide array of advanced features to keep you safe and connected as well. You’ll get the same available Chevy MyLink app suites and Bluetooth streaming, along with the Siri Eyes Free app that lets you use voice commands with your mobile app suite so you’ll never have to take your eyes off the road. The OnStar feature comes with RemoteLink, which lets you remotely access your car’s power lock, start, and diagnostic features from your smartphone or other device. You’ll also be able to opt for safety features like rear park assist and a standard rearview camera, along with a high-strength steel safety chassis and StabiliTrak electronic stability control. 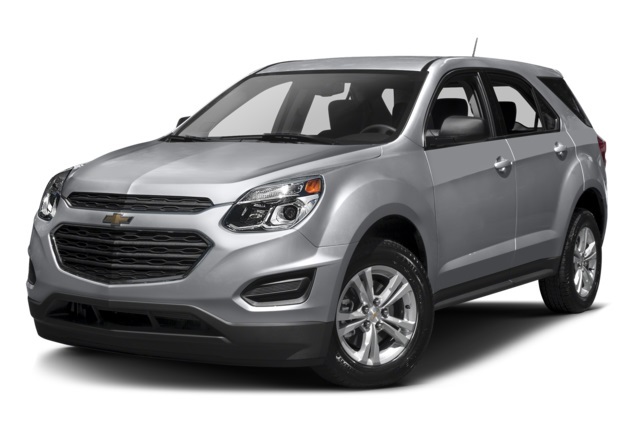 The 2016 Chevrolet Equinox is larger, with more engine options and more storage space–not to mention the towing ability. This vehicle is great for living in rural areas with lots of space, or for families who go on plenty of outdoors vacations with lots of gear. However, the 2016 Chevrolet Trax is a crossover designed for cities, with an efficient engine and a compact size for maneuvering around city streets. Before you decide on your next crossover utility vehicle, stop by Sunrise Chevrolet to test drive the 2016 Chevy Trax and the 2016 Chevy Equinox to see which one fits your lifestyle. Call us today at (630) 942-8300 and stop by our dealership at 414 E. North Avenue in Glendale Heights, IL.